We will help you choose to choose between famous restaurants or restaurants in the immediate vicinity, or the best farms and cellars of the most famous producers, where you can taste and buy wine oil and other excellent local products. The Ugolino Golf Club, one of the most beautiful in Italy, is less than 25 minutes from Relais Villa Il Poggiale. Special rates for the guests of the villa. 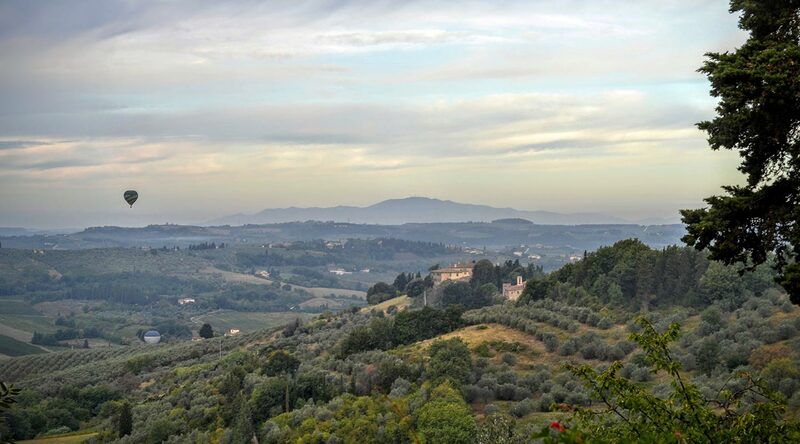 You can enjoy beautiful riding in Chianti, at the heart of the nature of the beautiful Tuscan hills. The Tuscan olive oil is considered among the best in the world. Guests of Relais can take part in the olive harvest, they can join the “pressa” in the old mills and taste the freshly pressed oil with a slice of bread toasted on the grill. Villa il Poggiale can arrange a special selection of Tuscan cuisine and the other Italian regions:Piedmontese cuisine with French influences, the imaginative cuisine of Naples and Sicily, where Arabs and Spaniards have left their mark. We will be glad to organize personalized cooking classes. The Relais Villa il Poggiale is about 30 minutes from San Miniato. The surroundings of this beautiful medieval town is famous for the abundance of truffles. You can participate in the search following the dogs trained to collect the precious tubers. The last weekend of November in the squares and streets of the town, is taking place a Truffle Festival with stalls selling all kinds of truffles. We organize visits to some of the most famous wineries of Chianti. We can also recommend cheese tasting and extra virgin olive oil, directly in the places of production. The Palio of Siena needs no introduction. The parade of ”contrade” and the horse race in the Piazza del Campo are a wonderful show. Town atmosphere in the days of the Palio is unique: dinners and celebrations in the streets, the blessing of horses in the churches, the music, the costumes, they will give you an unforgettable experience. Villa Il Poggiale is abot 40 minutes from Siena. We will arrange tickets for the Palio and for the dinners of the “contrada”. The balloon rides offer many itineraries to unique views of the Chianti area. Upon arrival Champagne Breakfast. Florence city center is only twenty minutes from Relais Villa Il Poggiale. In less than an hour you can reach the most beautiful art cities of Tuscany: Siena, Arezzo, Pisa, Lucca, San Gimignano, Certaldo, Volterra, Pienza, Montepulciano and many others.